"Paradise - if you can stand it!" 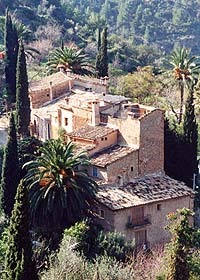 Deià, (using the local spelling), was made famous by the poet and writer Robert Graves who came to live here in 1930 and wrote "I, Claudius" under the brooding local Teix mountain. The village was also home for his 'white goddesses', young ladies without whose company he said he could not be inspired to write. Today, Graves is buried in the local churchyard but his spirit still lingers over the many painters and writers who flock to this pretty mountain village. Deya has many restaurants - one with an international Michelin star, others offering local Mallorquin cuisine or tapas snacks. There are a number of small bars offering an opportunity to enjoy local colour while sampling the beers and wines of the region..
Deya has an enchanting sea cove, usually pictured on the covers of guide books, with two small restaurants and easy swimming or snorkeling from a pebbled beach. 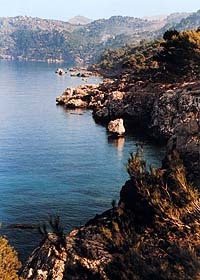 A good regular bus service operates from Deya either to Valldemossa and the capital Palma or to Soller and its picturesque port.